We are getting ready for our New Years Eve party and I found James doing this. . . . what a guy! Olivia AKA Calamity Jane is sporting a beautiful white summer dress, black cowboy hat and her choice of accessory to top of this outfit, a rifle. Of course what would a post be without this little guy. My favorite part about the holidays is getting mail that is not bills and stupid ads. I love reading about what friends and family have been up to the past year and especially to see how big everyone is getting (I mean the kids not the adults) Anyways I never know what to do with them after the holidays are over, so if you have any ideas or something you do with yours let me know!!! Well another Christmas has come and gone. It was so fun and relaxing just hanging out. ON Christmas Eve the kids opened one present which they knew were jammies, then we made hot cocoa and watched the Polar Express. We usually do the nativity but forgot so oops, next year I guess. Christmas morning woke up not too early opened presents and just played all day long!!! The kids got a wii from Santa and are loving it!!! Taylor doesn't look too thrilled to be getting jammies!!! NOtice Olivia not in the above picture. She was mad and pouting because she didn't want to open the present I handed to her. She wanted to open the one with Dora wrapping paper. KIDS!!!! We also got a dog for Christmas!!!!! JUST KIDDING We watched our friends dog and the kids loved it. Last night we went to the Oakland LDS temple to see the Christmas lights and go to the visitors center. It was so beautiful and the kids loved it. Before we went home we went to the visitors center and Olivia and Taylor were mesmerized by the big statue of Christ. Olivia sat in a chair just staring at him, then wanting to get closer stood right by him. It was so sweet. We then looked at all the pictures and they had all the Book of Mormon's in all the languages printed set up. When it was time to leave Olivia said she needed to go say goodbye to Jesus. So we went back by him and she said Bye Jesus, Love you. So sweet! Olivia ready for her first day of preschool. She is starting to go one day a week to preschool at a lady in our wards home. She was so excited to have a little backpack and a lunchbox just like the big kids. I love knowing that on that day I can go shopping with just Brett. Olivia was not scared at all and climbed right on his lap. However when she got off she looked a little confused. I asked her what was wrong and she said, "Where's my necklace?" She thought that she was getting her santa present right then. She was a little bugged the rest of the night. I just love his hat. Erin Bissell does that look familiar? Derick played Joseph in the nativity. Of course I have to have a few of my little baby boy!!!! Hanging the Christmas lights. Derick and his buddy Cayden I guess were cold!!! I was organizing all my pictures today and loved seeing how the kids have grown up!!! 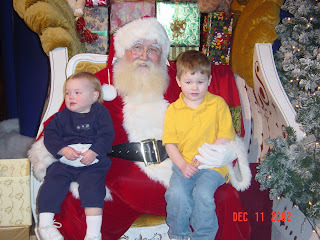 Here are some pic's over the years, some with santa and some Christmas card photos. The most recent are first so start at the bottom and scroll up!!! 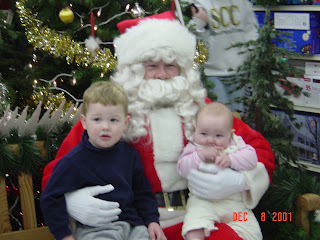 2007 I just love the way Olivia is looking at Santa and how Santa is looking at her. 2007 All of the kids. Taylor is not to sure about this guy!!! 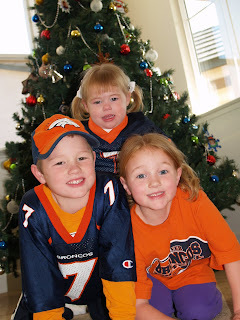 2006 Christmas card photo GOOOOO Broncos!!!! 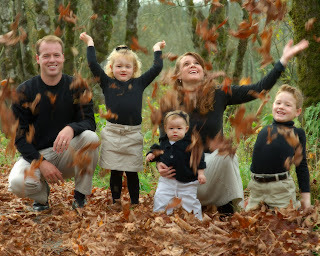 2005 Christmas Card Photo in Duvall Washington. I just love this photo!!! 2002 Derick was so shy around him. Look at his cute little face! 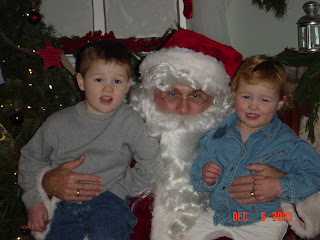 2001 This is the first Santa photo I have. I think we just went digital right before this. My friend just got a job an Jc Penney's and needed a newborn for some training hours. So I took Brett in with his stocking that I had just received in the mail. At first they thought I was a crazy person stuffing this little baby into a stocking. BUT after they saw the pictures they were going on and on at how adorable they were!! !